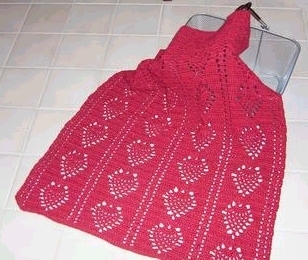 ...to my Comfort N'Joy Crochet photo gallery, featuring crochet projects I have created starting in late 2009. The photos in the crochet section on this site, along with my many other projects created up to the present, are now available to view at my photo album, Comfort N'Joy Crochet. So please visit there, though I plan to leave these pages in place also. from my all-time favorite movie - see my interests page! This crochet section of The Evergreen Refuge started out as a place where I offered my crocheted wares for sale. While I will still be glad to take orders for anything you see here or most any other small to medium-size crocheted items, that is no longer the main focus of this page. Due to time constraints combined with a lack of orders from my commercial page, I decided to simply display examples of the work I do, mention that I will take orders and leave it at that. I have been crocheting since 1979. 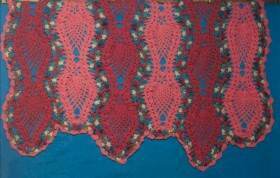 Like most crocheters, I started out making small yarn items such as scarves, moved on to sweaters and afghans, but eventually started concentrating on table runners and doilies made with #10 thread, though I do still also make yarn items. In 2001 I finally tried the thinner #20 thread for the first time and love it, but don't care for anything thinner than that to work with; I find it too cumbersome. I occasionally offer my items at local craft fairs, give them as gifts, make items for my own household and, as time permits, crochet for charity. I belong to an online crochet list that collects handmade face cloths and baby afghans for hurricane survivors and other people in shelters, and another group that collects crocheted squares to be combined with squares made by others to form "comfortghans" for the needy or bereaved. I enjoy periodically helping with these causes. My "Crochet2" page will include pics of a few of the face cloths and lapghans I made for charity purposes. Speaking of combining squares, the members of the crochet list I moderated at that time surprised me at Christmas '99 with the 42-square teal (my favorite color) and off-white afghan pictured above. It is truly lovely and I deeply appreciate these ladies taking the time to do this for me. I bought the pattern for this long pineapple table runner in an Annie's Attic kit. Since then, I have made a couple of additional runners with this pattern using #10 crochet cotton. I like this pattern not only for its old-fashioned look (I am partial to pineapple pattern) but the length can be easily adjusted to make it as long as you want, for a long shelf or piano top. 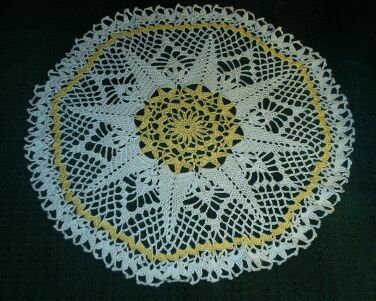 This 28" round pineapple table runner actually consists of seven small pineapple doilies that are crocheted together. I have also made the individual doilies. Or you could also keep going and make a tablecloth using this method, or even a bed cover! Told you I like crocheting pineapples! 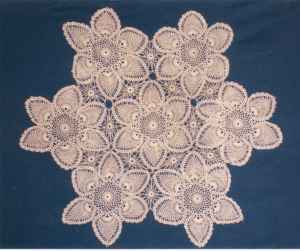 This is a 2 x 3 ft. oval table runner. This pattern, as well as the one above, came from a House of White Birches crochet magazine I bought in the 80s and was made with #10 crochet cotton. Yes, it's another pineapple item! 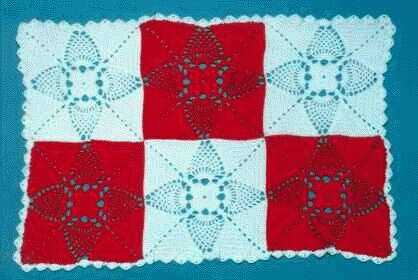 The pattern from this square came from an old Workbasket magazine. In addition to mats such as this, I have an ongoing project which will eventually be a table cover consisting of 121 of these 5" thread squares (mostly ecru squares with some rose and jade mixed in). As mentioned above, these squares are also great for afghans, pillowghans or pillows, made of worsted weight yarn so they come out about 12". Hey, it's a non-pineapple item! I really like making these flower squares since, unlike the above squares which must be woven together, the flower squares are "join as you go", meaning you attach the next square to the previous square made while you are crocheting the final round. 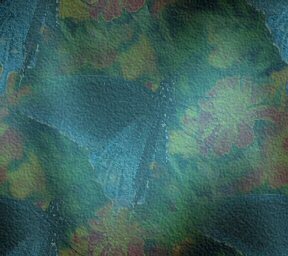 I also like this pattern since you can either make the squares solid color, make the flower in contrasting colors, or combine both as I have done here. This is an 80s House of White Birches pattern. This is half of a full-size pineapple strip afghan I made, using Red Heart worsted weight yarn. It worked up pretty fast and was fun to make. I have only made two so far and would like to make more! I love making this baby dress (yes, another pineapple pattern). 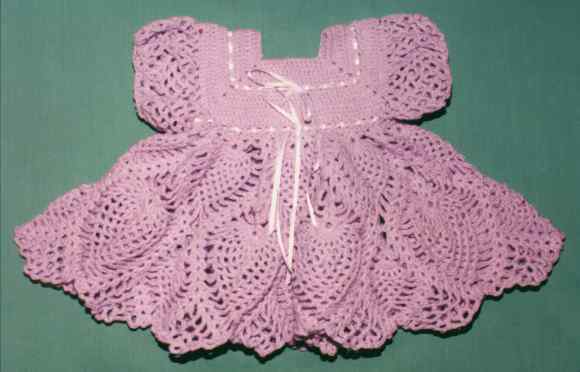 This is an Annie's Attic pattern (from a booklet called "Heirloom Baby Dresses") and I used Jamie baby yarn. 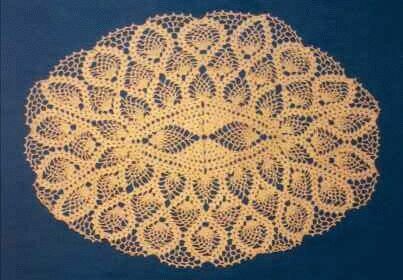 This "Sunburst" doily was made for Lovely in Kentucky; we were partners in an online doily exchange. This pattern was pictured in solid white, but I often end up with small amounts of colored thread and develop creative ways to incorporate them as an accent. Thanks to Lovely for taking the pic! More pineapples! This is one of my favorite afghan patterns. 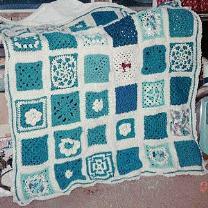 This lapghan was made in spring '04 for another exchange partner, Bonnie in Illinois, who took this pic. I used a unique handspun yarn purchased on eBay. This pattern looks great with each row of pineapples crocheted in alternating colors. I also used this pattern to make a full-size afghan for my household with alternating pineapple rows in cream, soft green and soft peach. Smaller items I love to crochet are Barbie dresses and Christmas ornaments (clothespin angels, snowflakes, and lacy covers that go over satin balls). I will get pictures of those items on these pages in the future! Click here to go to crochet page 2. Click here to go to crochet page 3. Click here to go to crochet page 4. Click here to go to crochet page 5. 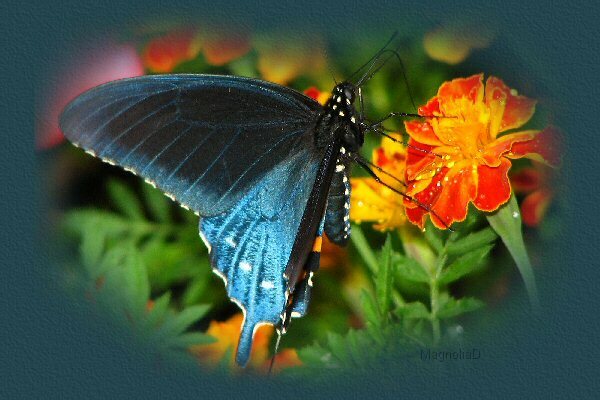 Click here to go to the complete Comfort N'Joy Crochet photo album. The above tracks link to the "Hobby Train" section of a terrific web ring alternative called "The Rail", which seven sections of The Evergreen Refuge have joined effective Dec. '08. Click the left or right arrows to visit like=minded sites belonging to the "Hobby Train". If you have your own web site, click the tracks to learn more about "The Rail". It's a great way to generate traffic for your site and get acquainted with similar sites!